Intranet for Document Solutions, Inc.
"We wanted pages that any of us could edit at any time, that we could expose selectively to others, and to provide an update-notification service to users based on the same security model." Document Solutions, Inc. (DSI) is a B2B services and consulting organization dedicated to maximizing the value of PDF documents and forms to distributors and end-users. DSI needed a way to integrate sales, estimating and project documentation with project descriptions, specifications, timeframes and related communications - and to do it all in such a way as to inform authorized users of updates to the documents. As company founder Duff Johnson explains, "Our international workforce and existing heavy email loads mandated a solution outside of simply trying to track more and more email. We wanted (essentially) pages that any of us could edit at any time, that we could expose selectively to others, and to provide an update-notification service to users based on the same security model. In this context, a flexible, easy to use wiki seemed like a good idea." Like so many EditMe customers, DSI discovered the product through a word-of-mouth referral. "We learned about EditMe from a colleague who had adopted it for a site to track committee meetings," explains Johnson. After evaluating several solutions, DSI selected EditMe for its ease of use, flexible user and page-level security, and its low cost. EditMe is a hosted solution, which meant that DSI incurred no licensing or setup fees and had no software to install, backup or maintain. And as DSI and its customer-base grows, there are no escalating per-user costs. Configurable email notification of changes to pages - users only receive change notifications for pages they have access to. Full-featured and reliable WYSIWYG editor. Sophisticated, multi-layered security policy system allows for many different user types and the creation of independent sub-sections within the overall wiki. 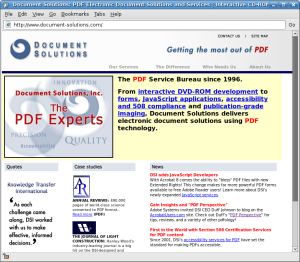 Document Solutions, Inc. (DSI, www.document-solutions.com) is a B2B services and consulting organization dedicated to maximizing the value of PDF documents and forms to distributors and end-users.